The top-seeded Spurs were outshot by 49 percent to 40 from the field. The Oklahoma City Thunder, superbly led by inspirational All-Stars Russell Westbrook and Kevin Durant on their home court, outplayed the San Antonio Spurs 105-92 in Game Four of the Western Conference Finals on Tuesday. Dynamic guard Westbrook contributed a game-high 40 points and 10 assists while league MVP Durant weighed in with 31 points on 11-of-22 shooting as the second-seeded Thunder evened up the best-of-seven series at 2-2. The top-seeded Spurs, aiming for a return to the NBA Finals after losing to the Miami Heat in five games last year, were outshot by 49 percent to 40 from the field. Point guard Tony Parker and Boris Diaw, off the bench, led the way for San Antonio with 14 points each but veteran All-Star forward Tim Duncan was held to just nine points on three-of-eight shooting. Spurs coach Gregg Popovich applauded the performances produced by Westbrook and Durant, but felt his team had paid the price for not being aggressive enough. 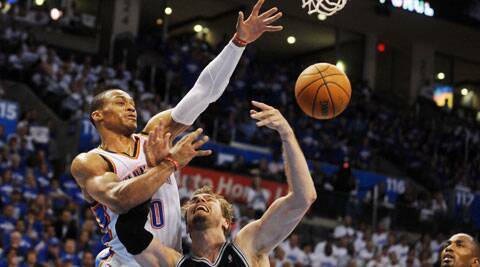 result: Western Conference Final: Oklahoma City Thunder 105-92 San Antonio Spurs (Series tied 2-2). According to the response, obtained and posted by USA Today, Sterling says V. Stiviano recorded him without his knowledge and thus the recording was illegal under California law. He also said he could not have “willfully” damaged the league because he did not know it would be made public. “A jealous rant to a lover never intended to be published cannot offend the NBA rules,” the response says. Meanwhile, the attorney for Shelly Sterling confirmed that Donald Sterling has given her written permission to sell the team. According to a person who is in contact with a potential bidder, who spoke to The Associated Press on the condition of anonymity because he was not authorized to discuss the process publicly, the Clippers are seeking binding bids before next Tuesday.